Scott Dixon came out on top of Saturday night’s IndyCar Series race in Fort Worth, Texas. 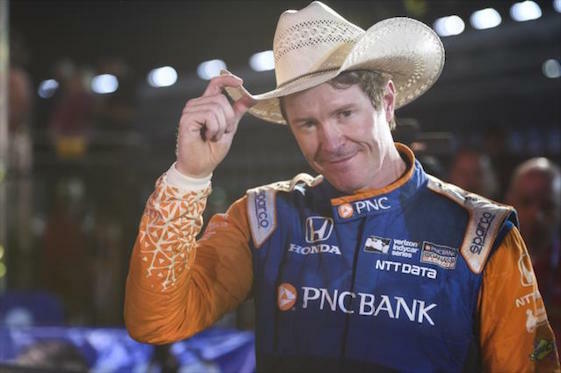 FORT WORTH, Texas – Another Saturday, another victory for Scott Dixon. One week after winning Race 1 of the Chevrolet Detroit Grand Prix last weekend, Dixon rolled to his third career Verizon IndyCar Series victory on Texas Motor Speedway’s high-banked/1.5-mile oval in the DXC Technology 600. Dixon, of Chip Ganassi Racing, led the race’s final 119 of 248 laps en route to a 4.2943-second margin of victory over Simon Pagenaud of Team Penske. Alexander Rossi rounded-out the podium for Andretti Autosport. The result moved Dixon _ a four-time series champion _ past Team Penske’s Will Power into the championship lead by 23 points over Rossi after nine of 17 events. Power, winner of this event last June, began the race with a five-point lead over Dixon but exited Texas in third with 321 points. The reigning Indianapolis 500 champion, Power was relegated to an 18th-place finish after a crash involving rookie Zachary Claman De Melo on Lap 205. Dixon’s 43rd career Indy car victory broke him out of a tie with Michael Andretti for third on the all-time list. The 37-year-old New Zealander now trails only open-wheel icons Mario Andretti and all-time leader A.J. Foyt Jr. of Houston. “It’s really cool,” said Dixon, wearing a white cowboy hat during his post-race presser. “Obviously I have massive respect for a lot of these drivers. But when you look at those names _ A.J. Foyt, Mario Andretti, Michael Andretti, the Unsers _ to me it still seems very strange that ‘Dixon’ is on that list, too. “I feel very privileged and lucky to do what I get to do. I love racing. I love the Verizon IndyCar Series. I think it’s the best racing on the planet, one of the most difficult with all the disciplines. For me, man, I just hope it continues. I hope we can keep a winning style, pick up wins. It’s so difficult right now it’s so competitive.” Forty-two of his wins, Dixon noted, have come while driving for Ganassi. Dixon previously won “America’s Original Nighttime IndyCar Race” in 2008 and 2015. His third win at TMS moved him into a tie with Sam Hornish Jr. of Team Penske, and one behind all-time leader Helio Castroneves, also of Roger Penske’s juggernaut. In addition, Dixon’s 119 laps-led moved him from fifth to second among open-wheel competitors here with 484, dating to his first start in Cowtown in 2003. This race was the first here run with sanctioning body INDYCAR’s new-for-2018 universal chassis built by Dallara. The sleek chassis produces approximately 100 fewer pounds of downforce in a bid to make the cars more difficult to handle, place more emphasis on driver skill and eliminate the pack racing previously associated with TMS. The new chassis, North Texas’ triple-digit heat and a softer tire compound provided by Firestone Racing combined to raise concerns among some drivers about the quality of show _ and tire blistering _ during the 372-mile event. Dixon added some of the driver concern was voiced because the weekend’s first 90-minute practice was conducted during the heat of Friday afternoon, while the race started at 7:45 p.m. (CDT) Saturday. “The track changes significantly once we get to the nighttime,” said Dixon, who paced the final one-hour practice Friday evening. “Once the track temp goes down, the grip really comes up. I had that sensation at the end of the last practice last night. Once the track temp started to come down, the grip level really came up. I knew it was going to be a pretty good situation for the race. Pagenaud, driver of the No. 22 Team Penske Chevrolet, started and finished second to score his first top-five of 2018. “I know that the fans expect something different than what the race is like,” the Frenchman said. “From a driver standpoint, I love it. I think I have to work more on my car to find a way to pass people. I think it’s possible. “We passed a lot of cars. It was a different kind of racing than what you’ve seen last year. I felt safe. I felt like I was really driving the car, really taking care of my tires, like I said. I had to think about what I needed. To me, that’s racing. To me, that’s the quality of being a race car driver. I don’t know about ‘the show’ because I got to watch the race. But to me it was pretty active. It felt pretty good. I’m not INDYCAR, I don’t decide anything. It is what it is. You get what you get.” Pagenaud paced 26 laps. Rossi, driver of the No. 27 Honda, earned his fourth top-five in the last five races and sixth overall. His last-best-shot at passing Pagenaud, Rossi said, came on a restart on Lap 185 following the second caution involving rookie Robert Wickens of Schmidt Peterson Motorsports and owner/driver Ed Carpenter in Turn 3. “I tried, I think, on the penultimate restart to go high on Simon in Lane 2 on Turn 1. That was pretty bad, almost catastrophic,” said Rossi, who led seven laps. “After that, I realized Lane 2 wasn’t really going to be an option for us. Despite the runs I had, Simon was doing a good job covering the line into (Turn) 1. The series will compete on the 4.048-mile/14-turn natural terrain road-course in Elkhart Lake, Wis., from June22- 24. Only nine of 22 starters here finished on the lead lap in an event that produced just three cautions. The third and final yellow flag period _ for the incident involving Power and Claman De Melo _ bunched race-leader Dixon with Pagenaud, Rossi, James Hinchcliffe of Schmidt Peterson Motorsports and Ryan Hunter-Reay of Andretti Autosport. Dixon nailed the restart on Lap 215 and his advantage grew to a massive 6.4484-seconds on Lap 244. However, that almost paled in comparison to Dixon’s largest lead _ 10.8-seconds over Rossi on Lap 155. “Yeah, the race was smooth,” Dixon said. “Got a little tricky there towards the end. I wasn’t sure, we were kind of right in the zone to try and do that last stint without a pit stop. We had to get a pretty big fuel number. That’s what I was worried about. Simon and I kind of checked-out. I just automatically thought the others were trying to get to the end of the race without having to do that last pit stop. Dixon’s next race will be the 24 Hours of Le Mans in France _ the world’s most prestigious endurance event _ next Saturday and Sunday as a member of Ganassi’s Ford GT program. “It’s always nice to jump on a plane tomorrow and head to Paris, then to Le Mans,” Dixon said. “The race week starts kind of quickly over there with the technical inspection thing Monday, in the afternoon as soon as you get there it’s kicking off. Before packing his bag for Du Mans, “Dixie” reiterated how much he enjoys competing in the Dallas-Fort Worth market and working with TMS President Eddie Gossage. “It’s always been a special place,” Dixon said of TMS. “I think Eddie and his whole team just do a fantastic job. The track has changed throughout the years, the style of racing has changed throughout the years. That changes from year-to-year. But the way that he does it _ you know, when you get to fire guns, wear cowboy hats, ’15 since my last win, nice to get a new hat, the other one was getting a little worn out. So that was definitely a positive. Verizon IndyCar Series point standings _ Dixon 357, Rossi 334, Power 321, Hunter-Reay 308, Newgarden 289, Rahal 250, Wickens 244, Pagenaud 229, Bourdais 218, Andretti 213.